Earlier this year, on my first trip to Southeast Asia, I traveled with a good friend from Ho Chi Minh City to Hanoi with stops at Nha Trang, Hoi An, and Hue. How to cross the street was one thing I learned along the way. 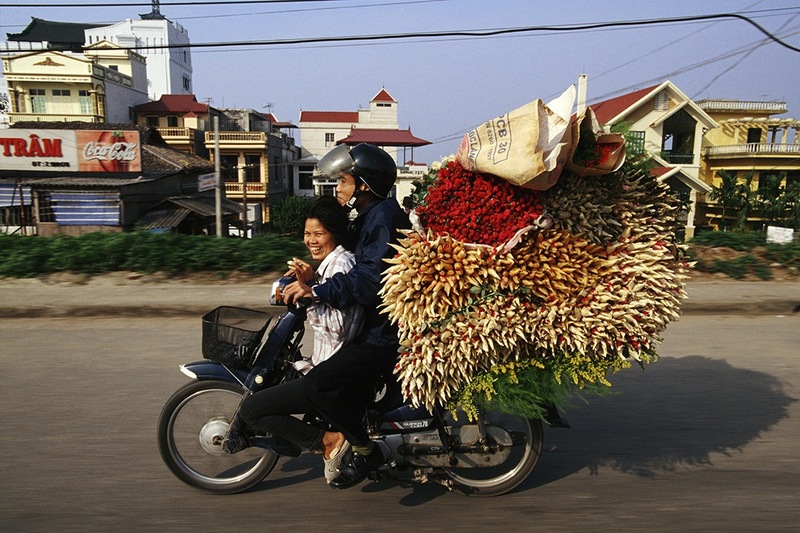 Motorbikes are ubiquitous in Vietnam. We saw rivers of motorbikes tear down avenues and careen through cramped alleys. Entire families piled on a single bike. Delivery men loaded up baskets upon baskets of produce onto their back bumpers. One guy zoomed by with a full-sized mattress strapped to his bike. It was awe-inspiring and somewhat terrifying at once. At first, it seemed unbridled chaos. I prepared to see wrecks. Surely with all these people on all these motorbikes, there would be several run-ins. However, as we grew used to the traffic, it became clear that there were understood rules of the road. The initial seeming chaos in fact possessed underlying order. Everyone knew when to gas and when to brake, and how to gradually maneuver around one another in confined spaces. A motorbike rider needing to make the next left turn would gradually veer left, motorbikes between her and the turn moving ahead or falling behind to make space. Where there had been no room to move seconds before, there was now a gap to get through. Having lived in New York for the past four and a half years, I feel relatively confident in my ability to cross streets. I’ve darted between cabs and delivery trucks, discounting walk signals and relying on my own instincts and risk tolerance – all of which is supported by the fact that vehicles here heed traffic signals. When the light turns red, most drivers don’t dare run it. Not necessarily so in Vietnam. Someone’s probably coming through an intersection no matter the signal color. Thus I found my street-crossing confidence wavering in Vietnam. Looking upstream on one-way streets, we were confronted with hundreds of motorbikes coming past. At first we’d step out into the street off the sidewalk, only to be brushed back like a batter facing an aggressive pitcher. “How do we do this?” I said aloud a few times. There never felt like a right time to go. Taking a cue of other pedestrians, we learned the trick was that there wasn’t a right time to go. Or rather, the right time to go, to get out into the street and make our way across, was now, was right then, was the current moment. Saying it “screw it, let’s do it,” we stepped off the curb and into traffic. Lo and behold! the motorbikes continued to zoom, but they zoomed around us, like water flowing to the left and right of a large stone in the middle of a river. Step after step, we made way, eventually landing safely on the other side of the street. Brilliant! Being on the other side of the world for a few weeks allowed me to reflect on my everyday life in New York. Part of this introspection was realizing that there’s no ideal time to do anything in life. If you wait for the perfect time to start something, you will be waiting forever. If we had waited for the perfect time to cross those busy streets, we may still be standing there. The only perfect time is the present moment. You just get out there in the mix and make your way forward. Vietnam taught me several lessons, and this is only one of them, but a vital lesson it is. If I want to make a career change or talk to an attractive stranger or learn how to make pottery or start my own blog or anything else, I simply need to say “screw it” and just go. The stream will part, and I will find my way forward, step after step.